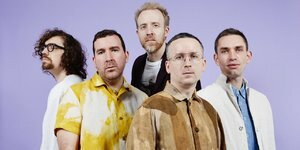 Hot Chip are back after a long gap, but oddly they’ve come ready to help you split up with your partner. Really, because they have a song called Hungry Child, and this modern house banger is accompanied by a video about a failing couple who learn the path to peace is splitting up. Being haunted by the song. It’s an unusual video, by Saman Kesh, and a fun song, so gear up for June 21st when LP A Bath Full of Ecstasy comes out.